The first smoke has died down. But the war has just begun. Page vs Page. Facebook vs Google. Two Superpowers against each others. In the first place these social networks giants was created for people to connect with people. Or “friends and family” as Facebook use to call it. With their “profiles” as a basis for the communication within the network. Then the time came for the companies to engage with their target audience. With their “pages” as a basis for their communication. And I guess the battle has just begun. As far as I can see and understand both of these giants have just ended up into a massive clash! Where the value proposition for their users (as companies, brands, and others) is very much the same. 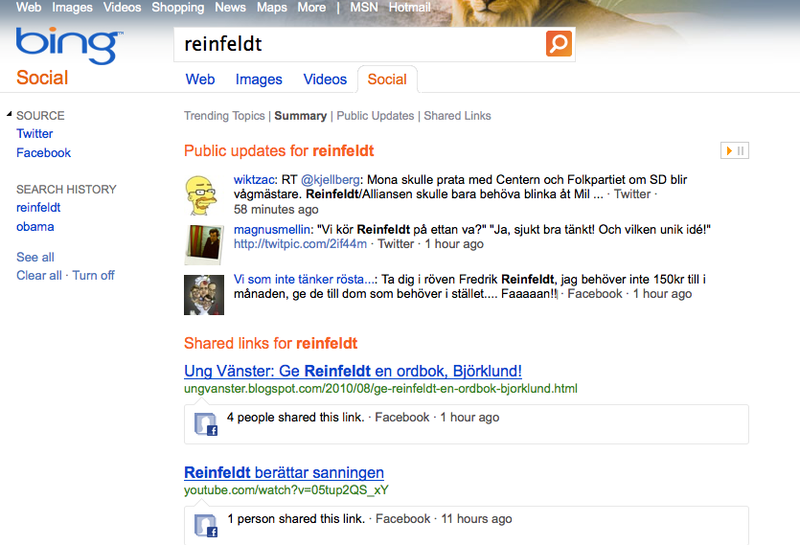 The greatest benefit of branding products in Google plus will be the link up with search engine. The search engine will track the brands on Google plus pages easily and will bring them to the top list in the search engine. Just typing “+Google” will take the user directly to the company’s profile page. Facebook has again got something that will affect their market. The like button of Facebook is similar to the +1 button on Google plus. The hangout button is simpler to use when compared to video chat in Facebook with Skype. 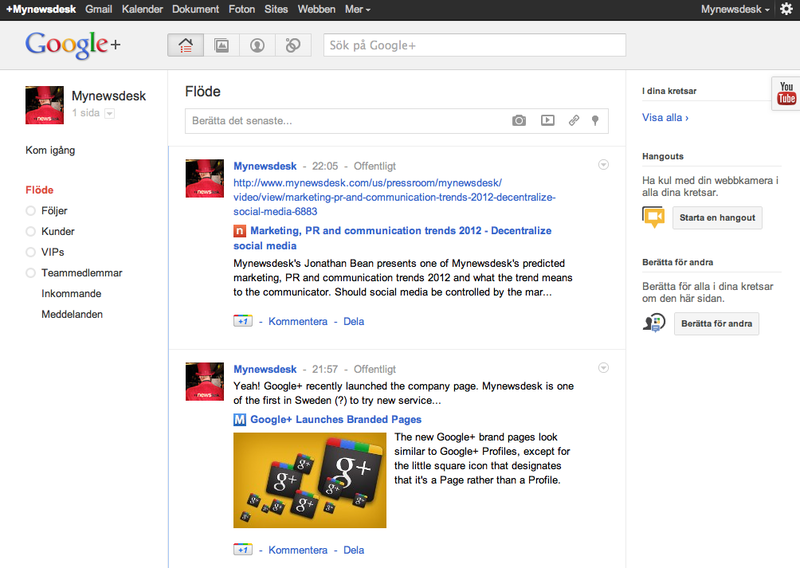 Now Google plus also going corporate will be a tough completion to Facebook pages. Well – as I said – the battle has just begun… and I’ll will follow this war with great interest. Now – I’ve just created my own “Google+ page” and I’m looking forward to see yours, and follow your point of view in this matter. Mashable show you how to get started. Everybody in communication business talks about it everywhere! The new and ever-changing communication landscape has turned the media industry on its head. The confusion is now complete. Much of what we have learned and become accustomed to is no longer valid. This applies particularly to media, journalism, public relations, marketing, and sales. The professionals within each of these fields are either desperately holding on to their old identities, or are groping around for new ones. “Markets (and marketing) are conversations” as the Cluetrain Manifesto puts it. Conversations are based on relationships. Just like PR. Because PR’s is all about relationships, right? It’s all about relationships with both the market and those who influence it, including journalists. However, since all consumers now have access to almost exactly the same “tools” and methods as traditional journalists, it seems like the market has in some way also become the journalists. The market represents a long tail of new journalism and new media that perhaps has the greatest influence on a company’s market and might perhaps be their key opinion leaders. “Put the public back to public relations!” as Brian Solis put it long ago. People have started to talk to each other in social media at the expense of, or sometimes in tune with, traditional media. They’re no longer writing letters to editors. They would rather publish their news ideas directly on the Web. Media consumption, and production, publishing, packaging and distribution in particular, have rapidly moved in to the social web. And both the PR and Marketing communicators are following, or are at least gradually beginning to do so. As the market moved to the web, and the web has become social, marketing communication has become “social” too. Companies have started to talk directly with their market. And I mean “talk”, not pushing out information. Campaigns with no social component become fewer and fewer. “Monologue” ad banners, with decreasing CTR and increasing CPC, are becoming less acceptable. Google revolutionized with Adwords, Adsense and PPC. Press releases written by former journalists synchronized with Adwords and presented as text ads, turned things upside down. Aftonbladet has been very successful with advertorials where only a small ad-mark distinguishes the ad from an article produced by journalists. This method is about as successful – and deceptive – as “product placement” in TV and film. That method has gone from small product elements in parts of a program to a complete sellout of the entire series or film. (In Sweden, think Channel 5’s Room Service and TV4’s Sick Sack.) But what can the television business do when the consumer just fast-forwards past the commercials, or worse still, prefers looking at user-generated TV like YouTube? What will newspapers do when consumers ignore their banners? They will convert advertising into editorials. Or vice versa: they will charge for editorial features and charge companies to publish content on their platform, without involving any “investigative” journalism. IDG calls their version of this “Vendor’s Voice”, a medium where companies publish their “editorial material” (it used to be called press information) directly on IDG.se and its related websites. The service is conceived and hosted by Mynewsdesk. It works pretty much like the Apple App Store; it is possible for any media to set up their “channel” (the media) on Mynewsdesk, promote it, and put a price on its use. Essentially, when companies publish their information in their own newsrooms via Mynewsdesk, they can also easily select any relevant channels for the information in question. The service still has the internal working title “Sponsored Stories”, which today may seem a little funny when that is the exact same name Facebook uses for its new advertising program, where a company pays for people in its network to share information about that company with their own friends. But the press release… That’s information for the press, right? Or is it information that is now a commodity, often published in the media, directly and unabridged, much like the “sponsored stories”? Maybe it is information that can reach anyone that might find this information relevant. They might not be the press, but they are at least some kind of journalist, in the sense that they publish their own stories, often in same media as “real” journalists, in platforms created for user-generated content. Everything goes round and round: side by side are readers, companies and journalists. All collaborate and compete for space and reach. The causal relationship is as simple as it is complicated. People are social. People are using the Web. The Web has become social. People meet online. The exchange is rich and extensive. The crowd has forced the creation of great services for production, packaging, processing and distribution. These are exactly the same building blocks that have always been the foundation for traditional journalists and the media’s right to exist. Strong competition has emerged, but there is also some interaction and collaboration. People have opted in to social media at the expense of the traditional media. They rely on their own networks more and more, which has forced advertisers to find a place in social media too. Traditional ads are replaced by social and editorial versions that are designed to engage or become “friends” with your audience, talking to them as you would talk to friends. This is similar to how companies today present their increasingly transparent and authentic communication in their own social media newsrooms, where the audience is invited to contribute their own experiences and opinions, and partly acts as a source of story ideas for journalists. All in all, it’s a wonderful, fruitful, but oh-so-confusing melting pot. Hur ska jag lyckas identifiera och kommunicera med hela den nya och brokiga skara människor som har inflytande på mitt företags marknad? Gör ditt företag extremt tillgängligt och transparent. Se till att all information om förtaget och dess verksamhet når ut i alla relevanta sammanhang, där din målgrupp förväntar sig att den ska finnas, inte minst när de söker efter den. Lyssna på din omgivning, hjälp den, och skapa förutsättningar till självhjälp. Och fokusera dig på den exklusiva skara som har störst inflytande på din marknad. Beroende på vilken verksamhet deras företag bedriver är en hel del av de sistnämnda sannolikt journalister, men bli inte förvånad om majoriteten av dem återfinns bland deras kunder, branschkollegor, anställda, partners, återförsäljare, leverantörer, m fl. Ben Cotton på PR-byrån Edelman Digital i London skrev nyligen ett blogginlägg där han tipsar oss om tio gratis verktyg för att finna inflytelserika människor. Gissa en gång om något av tipsen omfattar någon mediedatabas i traditionell bemärkelse? NOT. Tjänsterna är av typen sök och nätverk med webben som spelplan. Och fler tips av liknande slag finns. Jag gillar dem alla, även om några inte funkar i Sverige. Men om jag känner typen Ben rätt, så organiserar han dessa människor i något CRM-liknande system för bearbetning. I bästa fall med några sociala plug in’s. Det gillar jag inte. Jag förordar nätverket framför CRM’et. Dessutom så tycker jag att Ben förbiser en viktig faktor; att den som ger är också den som får. Det räcker inte med att hitta dem, du måste bidra med något. Ben snuddar förvisso vid frågan, när han poängterar vikten av att bara prata med dem som är engagerade och intresserade av dig. Men vaddå “prata”? Utöver Ben m fl’s tips så skulle jag vilja lyfta fram kraften i att förse målgruppen med verkligt värde; intressant och relevant information, tips, hjälp, nyheter, med utgångspunkt ifrån vad du lärt av den. Materialet driver trafik. Bland trafiken finns fans. Några av dem är dina viktigaste opinionsbildare. Vig en del av ditt professionella liv åt att serva dem. Och – gör det i ett nätverk. 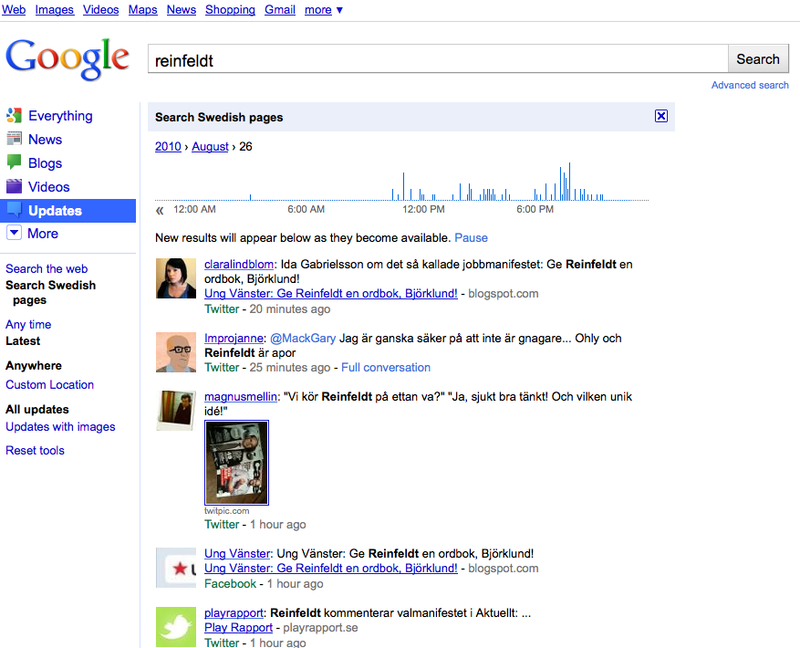 Idag flyttade man över Google real time search från experimentbordet till den egna hemvisten google.com/realtime. Samtidigt passade man på att preppa tjänsten men några nyckelfunktioner som att söka i ett geografiskt begränsat område “nära dig”, alerts med e-post samt enkelt följa tråden av en räcka uppdateringar som sammantaget kan tänkas utgöra en konversation. Allt det här låter ju toppen. Men… tjänsten haltar rejält utan Facebook. Varav de flesta av dem sällan eller aldrig dyker upp i sökresultatet då de så sällan används i relation till ex Twitter. Nej, så länge Facebook dominerar den sociala webben, så blir ingen realtidssöktjänst särskilt intressant utan innehåll från denna nätverksgigant. För hur man än vrider och vänder på det så är det innehållet som utgör det primära värdet inte funktionerna. Sluta fokusera på PageRank. Som enskild faktor är den irrelevant för dina möjligheter att synas. Och definitivt som måttstock för framgångsrik PR. Egentligen inget nytt, men PR-kommunikatörer klamrar sig till synes fortfarande fast vid Larry Pages algoritm, i tron om att den ska frälsa dem. När websök blev den vanligaste inkörsporten till alla aktiviteter på webben, blev en stark och tydlig närvaro i websök en mycket viktig PR-aktivitet. Och eftersom Google har den ledande söktjänsten för webben så har deras algoritm för hur du där rankas blivit högsta prioritet. Men det var då det. Webben ändras. Folk med den. Och vice versa. Det råder inga som helst tvivel om att det fortfarande är väldigt viktigt, sett ur ett PR-perspektiv, att komma högt upp i resultatet av relevanta sökningar på Google. Men det är inte uteslutande din PageRank som avgör det. PageRank är bara en av hundratals faktorer som har betydelse för hur du syns i Google. Och där Larry Pages skapelse – Page Rank – lever en förtynande tillvaro. Metrics are useless unless you can track them, and you can’t track Page Rank. The best approximation of your Page Rank you can get is 6-9 months old, and even then you’re not sure it is correct. If you cannot accurately and frequently get new data for a metric, it is pretty much useless. Page Rank has nothing to do with SEO rankings or results. I know of websites that have a Page Rank of 0, and yet they still get organic rankings and search traffic for competitive search terms. Page Rank is not relevant for real time search and social media results. Increasingly, social media conversations, real time news and status updates and other content are making their way into search results. 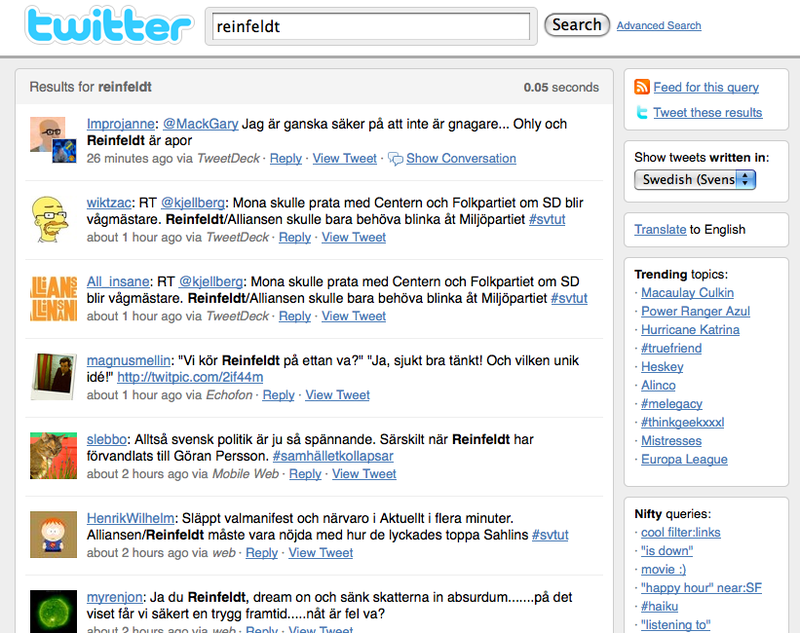 Even though the Page Rank for a tweet or status update is 0, they still show up in results. Same thing for news releases and other content. Page Rank is not a results metric. Typically it is best to measure things that get you real results for your business (customers and revenue) or things that directly lead to those metrics (leads). But Page Rank has nothing to do with any results – see the previous two reasons. Even Google says Page Rank is not important. Google removed Page Rank from its webmaster tools because it is not important. Google Employee (Webmaster Tools Analyst) Susan Moskwa says “We’ve been telling people for a long time that they shouldn’t focus on PageRank so much; many site owners seem to think it’s the most important metric for them to track, which is simply not true. We removed it because we felt it was silly to tell people not to think about it, but then to show them the data, implying that they should look at it.” And many other places Google tells you to not worry about Page Rank. I see so many people asking “Will this increase my PageRank?”. Could you tell them – once again – that ranking is not just about “PageRank” but also 200 different signals? And while being there, why don’t you tell us about those 200 different signals? Bakom allt detta ser jag ett stressat Google som kämpar febrilt för att hitta ett exsistensberättigande på den sociala realtidswebben där just PageRank helt spelat ut sin roll. Och där Google hittills har haft väldigt svårt att positionera sig med vettiga tjänster. 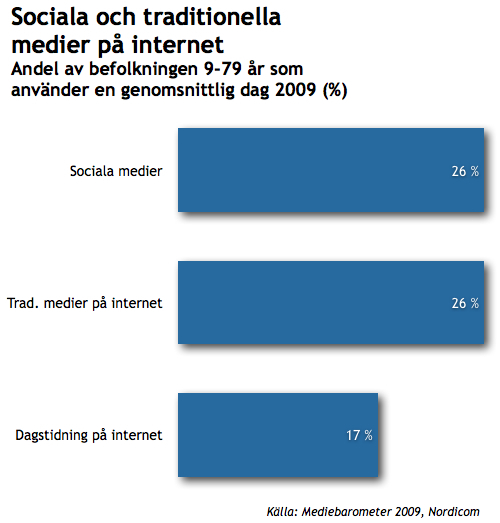 @jocke (Joakim Jardenberg) tipsade mig också om ett inlägg på Internetstatistik.se där det framgår att Sveriges befolkning mellan 9-79 år använder social media (26%) i lika stor utsträckningen en genomsnittlig dag, som den använder traditionell webbmedia (26%). Äntligen! Nu struntar Eniro i trafiken, och lämnar Kia-index, med målet att generera verkliga leads till sina kunder. Kia-index är helt irrelevant, säger Eniros nordiska produktchef Mathias Hedlund. Branschmåttet unika besökare är missbrukat och trubbigt då det på intet sätt mäter besökarnas verkliga värde. Annonsörerna ska välja oss för att de vet att köpkraften finns här, menar Eniros marknadschef Jonas Dahlquist. Förändringen är ett led i bolagets ”gula revolution”, som sikt ar på att göra Eniro.se till Sveriges ledande köpmotor, skriver Dagens Media idag, och menar att Eniros förhoppningen är att annonsörerna ska fokusera på leads istället för antalet unika webbläsare. Eniro stämde oss en gång för att vi sa att vi var större än dem. Man kan ju undra varför de överger sin strategi att vara störst på Kia-index, som de kämpat för så länge, just när vi har gått om dem flera veckor i streck. Själv tycker jag Eniro’s utspel är beundransvärt, klokt, om än dock vågat. Inget ont om Kia-index, men visst är det så att trafik helt saknar betydelse så länge den inte genererar värde. Jag är omåttligt trött på termer som “räckvidd”. Och allt som har med kvantitet på bekostnad av kvalitet att göra. Att antalet, frikopplat från andra kvalitetsaspekter, skulle ha betydelse för kommunikationen är en fatal missuppfattning som bitit sig fast och vägrar släppa taget. Tack, Eniro för att ni visar vägen. Och hoppas att ni vågar löpa hela linan ut. Nu återstår att se om ni kan påvisa affärer som täcker kostnaden för era kunder att synas i era media. Jag håller tummarna. Google lanserar Google TV – och ger därmed TV en ny dimension tillsammans med ledande bolag som Intel, Logitech och Sony. Äntligen, bör tilläggas. För detta har man pratat om länge utan att något lanserats. Nu ser det i alla fall ut att bli verklighet. TV:n flyttar in i webben. Och Webben flyttar in i TV:n. Eller snarare de två integreras i en helhetsupplevelse, där webbens användarvänlighet slås samman med TV:ns tillbakalutade underhållningsfaktor. Google TV ger tittaren, eller besökaren, möjlighet att söka efter exakt det han/hon är intresserad av ur en uppsjö olika källor som kabel TV- och satellit TV-leverantörer, webb, eget personligt material eller från mobila applikationer. Spara och personifiera. Den här videon ger dig en hyfsat pedagogisk bild av vad som komma skall.